Note: Donna Cronk recently shared her guest blog, Friendship is One of Life’s Sweet Places. This was my guest post on Donna’s blog to share my perspective on our unique connections. Thank you Donna for a friendship that continues to grow and entangle our lives and hearts! Connections are our sense of belonging. We have connections from our tight-knit circles to ever-expanding circles that eventually connect us with people throughout the world. A week ago, I was invited to spend time with one of my Indiana connections: Donna Cronk. Donna was launching the “book tour” for her sequel, That Sweet Place: At Home in the Heartland. The venue was the aftercare group at the local funeral home in New Castle, Indiana. Witnessing her connections prompted me to reflect on our connection through the years. I trace our connection back to our boys growing up together in the same school district, playing on the same sports teams, and living on the same street. We were friendly neighbors busy with life. Donna likes to remind me that Carriage Lane was not the place where we first met. Over 26 years ago, we were in the same Sunday school class at the same local church. In a way, our connection has also been a journey of faith where God kept putting us together for a reason. God eventually revealed the reason a couple of years ago, when we shared our mutual desire to self-publish a book. In practice, the enduring connection has been our shared love of writing. Writing was natural for Donna as she went to college for journalism and has been a community journalist for over 27 years in one Indiana town and county. Writing was never on my radar given my engineering background with its focus on numbers and logic. I was the stereotypical engineer. I never aspired to be a writer and I did not care about writing, other than what was necessary to complete an assignment. Donna’s recently published book was the day’s connection for the crowd that attended her new presentation. As I was introduced to people, I asked, “So how do you know Donna?” Some connections were common to all of us: work-related circles with both current and former co-workers. Other connections were more specific to the book: editors, reviewers, fellow self-published authors, and readers who wanted to know what happened next in the Sweetland story. It was a friendly crowd with people Donna knew and friends of friends that became part of Donna’s new connections. Donna shared her presentation, “Bloom Before You Are Planted!” Her message reminded us that God has good plans for each one of us. The deeper take-away involved self-reflection. Am I paying attention to God’s nudges? Will I act on the seeds that God plants in my heart? Do I embrace God’s joy for my growth? 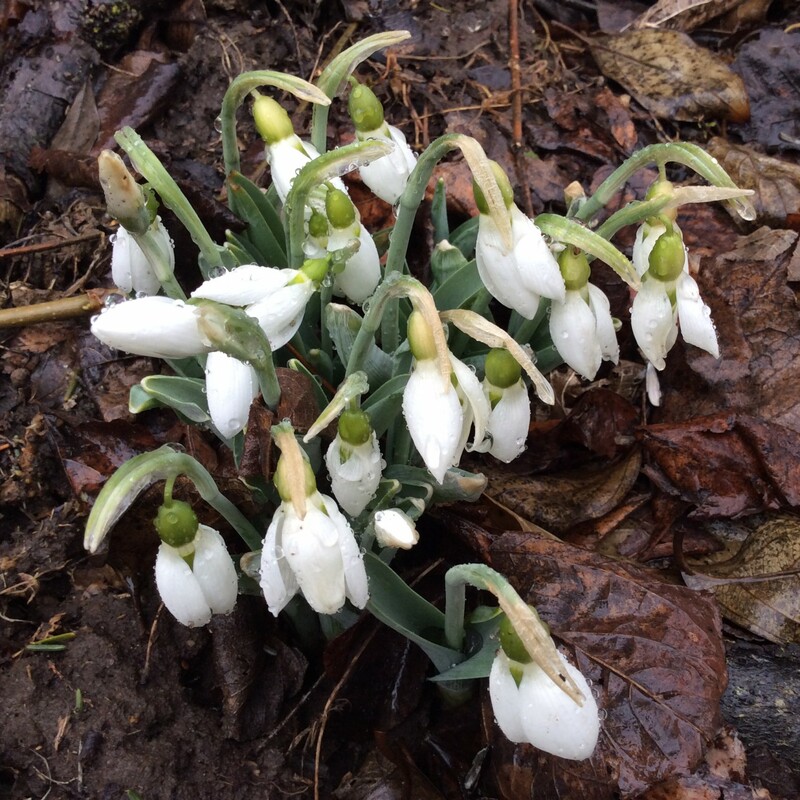 Will I praise God for His beauty inside of me, waiting to bloom in the perfect season? After Donna’s program, she and I enjoyed our unique connection by simply sitting and chatting for hours. We covered much territory, revisiting old connections and discovering new connections. Finally, it was time to walk out to our cars and say goodbye for the day. That’s when I remembered my family cookbook that made the trip with me. Over the previous six-and-a-half hours, I had completely forgotten about the cookbook I wanted to share with Donna. Conversations about family, recipes, memories, and traditions are some of our favorite connections. I was struck once again by the nature of genuine connections. The time goes by too quickly and we are left with a longing for the next visit. The best connections always explore the nuances of life and entangle hearts! Although I am the taller of the two of us, I look up to my friend Donna Cronk. She repeatedly has said, “Yes!” to God and stepped out in bold faith. God has given me the special gift to be a small part of those adventures and to experience the excitement of God doing something new in Donna’s life. Donna slows down enough to write this guest post. Are you ever amazed at how God works? I sure am. For years, Debbie McCray was a friendly neighbor down my street. She was Andy and Ben’s mom, and their home was one of those lovely “safe places” where I knew my son was safe and happy when there to play with her sons. When life moved the family from Indiana, I never expected to hear from, let alone see them again. This is apparently where God chuckled. Many years later, ten perhaps, and I’m not even sure quite how (hear Him laugh?) Debbie and I started emailing each other. It wasn’t so much, or even at all, about rehashing life on our familiar lane, or detailing about what our sons were now up to. No, our cyber chats were about writing. But a year or so ago, our friendship took an advanced turn. Debbie allowed me the privilege of editing a project of hers. As a writer of newspaper and magazine articles, and now two novels, I know firsthand that it is a big deal to entrust my labored-over words with an editor. It’s also a risk because an editor’s job is to question, find flaws, attempt sharpening and tightening copy. It can be a painful process for both writer and editor. Usually it’s not something friends should probably tackle together. Yet I knew that I would treasure Debbie returning the favor and editing my new book’s manuscript. My book, the newly published “That Sweet Place: At Home in the Heartland,” went through three editors, each assigned with specific tasks in the project. Debbie’s was to react and provide general suggestions, point out any problem areas, but most specifically, to look at it with spiritual eyes and recommend scriptures that might inform each of the chapters. She did a beautiful job. There was one area of the story, a turning point, really, where the lead character, Samantha, experienced a meeting of the minds with her boarder after they started out with a tense relationship. Debbie gently pointed out that she wasn’t quite feeling the specifics of that turning point. Her nudge sent me back to the manuscript where I added a more direct change in their relationship. It greatly helped move the story forward. In fact, it was an essential edit. As readers of Debbie’s blog, you might enjoy seeing this other side of your friend: that of editor. I asked Debbie if I could write this piece. I’d be less than honest if I didn’t admit this up front: I’m hoping you might consider having a look at my book. You can read all about it on Amazon … as well as Debbie’s comments about it in the book description there. But I also wanted to thank Debbie publicly for her role in this book. Thank you, Debbie. Donna Cronk still lives in Pendleton, Indiana. She blogs at www.donnacronk.com. Contact her on her Facebook author page at Donna Cronk. And if you read her new book, please share with her what you think. My dear friend Donna shares from her heart as she reminds us that God abundantly blesses our obedience to Him. Donna Cronk is author of the women’s Christian novel, Sweetland of Liberty Bed & Breakfast, available on Amazon in print or Kindle. The sequel will be released next summer. You can hear more stories from Donna’s life at her blog: donnacronk.weebly.com. I’ve always been a hands-on mom. Raising two sons was the joy of my life. Room mother, baseball-dugout mom, soccer, scout, and band mom, and I was that mom who washed the whole team’s grimy uniforms at midnight in a motel during a tournament road trip. Maybe it was because my older boy had a severe heart defect and we almost lost him as a baby, that I saw early on how precious every moment with them was. Or maybe it was just how I was wired. Once they hit their teens, I started internally fretting. I couldn’t imagine our home without the boys’ presence. What would I do if there were no games, or scout outings, or band performances to attend? I couldn’t imagine the empty nest. Back then I was in a church life group of a few women my mother’s age. These women had been through many things, and I enjoyed their wisdom, and the structure of their group. The leader was gracious and allowed plenty of time for chitchat, but also kept it moving so that we got in a lesson and prayer time, as well as got everyone home at a decent hour on a Sunday night. My own mother had long-term advanced Alzheimer’s disease and spent years in a nursing home before she passed. Being in the company of older women filled a void of missing mom and women like her. I was content in that group, but it occurred that once the boys left the nest, I’d like to start a women’s life group for empty nesters. I told no one, keeping this idea to myself. I had no specific women in mind, but felt sure there were some like me in our congregation. Besides, I had a few years to work on a plan. I’d research Bible studies, keep my eyes open for “the right women” to ask. I had three years before son number two went to college. In three years, I’d begin to pursue this idea. It was enough having it on the back burner, a comfort when I thought about the boys leaving home. I kept it hidden in my heart. Then one night at my older women’s meeting, the leader asked if she could see me afterward. I couldn’t imagine what she wanted. She shared that she and a ministry leader wondered if I would consider leading my own women’s life group. This stunned me. How could they have known my plan? While it was my usual nature to thank them and say maybe – someday – and explain that I wasn’t ready for this challenge – what I said instead was, “Yes!” I recognized this unexpected invitation as the Holy Spirit confirming this idea I had begun nurturing, and that He was asking me to step out in faith and do it now. I met with the ministry leader and told him that I had an idea what such a life group might “look” like: It would be a group of midlife moms whose kids either had left home or were about to, and we would do life together, with the Lord’s leading, in this next phase of life. We could support, encourage, and pray for each other as we navigated such landscapes as becoming mothers-in-law, grandparents, and dealing with things I hadn’t yet imagined. Ironically, he told me that the pastor’s wife, Delaine, had the same vision for a life group and maybe the two of us could lead it together. Delaine and I went to breakfast to talk about this. I was nervous because we didn’t know each other well. Come to find out we were the same age – five days apart, and we had other similarities. The plans came together with ease. She had a few women in mind; I had a couple. We asked them and they came to the meeting. We used the format of the life group I had attended. That was almost nine years ago. In that time, The Midlife Moms (MLMs for short) has enjoyed countless outings together and served the church by cooking dinners, helping with Bible school, and planning all-church retreats. In-between, we studied and prayed with and for each other, laughed, cried, vented, and praised God. I am grateful for the lessons we have studied together, the hard truths we have sometimes faced in those lessons, and in the answered prayers we see. We have fun. We know each other’s cast of characters and life stories. We are friends. We are sisters. My husband and friends have told me that I have changed since these women came into my life. I am happier, less judgmental, feel more confident, and grounded with the support of other Christian women who have my back as I have theirs. I belong. I laugh at the joys that God, through this group, has given me; life’s bright spots that I never could have imagined possible. For example, I am a “water” person. I love being on or near the water but that is not an interest of my husband’s. One MLM has a lake house and four times a year, she generously hosts our gals where we ride her boat around a beautiful lake, swim in the clear water, and go tubing. God gave me this desire of my heart to be around water in a way that I never would have had otherwise. I also had never heard of Bible Study Fellowship until a member of the group invited the MLMs to go. A couple of us are members and I thank God for how much my knowledge and love for His Word have grown in me. God even granted me a life-changing visit to Israel and guess who baptized me in the Jordan River? My co-leader, Delaine. On the other arm was another MLM sister. We have never had a cross word between us. With about a dozen women gathered in one setting for nine years, I consider this nothing short of a miracle. I’m reminded of the Israelites who had to be ready to move when God said so. He was taking them to a new land just for them. They would do well if they listened to His instructions and obeyed what He said. I am so grateful that God planted this seed of a women’s life group in my heart, and then confirmed it through others who asked me to move before I thought I was ready or capable. What a blessing I would have missed had I said “Not now, Lord,” or “Me? Who am I to do this? Pick Delaine, she’s the one qualified.” For whatever reason, He wanted me to help found and lead this particular group, this particular ministry. What seeds has God planted in your heart or mind? Will you move when He asks or wait for what you think is a “better” time? When He says go, I urge you to go. Blessings await you. And, such opportunities may not pass your way again. Guest Blogging on He Holds My Right Hand / What Is Your Favorite Song? This blog was originally posted on Victoria Stankus’s website, He Holds My Right Hand. The prompt I responded to was, “What is your favorite song. Why?” (My God story is found in the why!) Vicky is a cancer survivor, homeschooler and blogger. Vicky’s plate is full, but she knows her cup overflows with God’s mercy and goodness. Check out her blog for a transparent peek into her life of following God. At my mom’s bedside, we knew the time was soon. To fill the heavy quiet in the room, we softly played music. The words of I Will Rise hung in the air. The second time through the song, my mom took a deep breath and was gone. In my heart, I heard my mom respond to Jesus’s invitation as she grabbed hold of his hand. And I will rise when He calls my name. No more sorrow, no more pain. I will rise on eagle’s wings. Before my God, fall on my knees. And rise, I will rise. Guest Blogger: Donna Cronk / Where is Home? The home down the lane. Picture submitted by Donna Cronk. Introduction: Home sweet home is where our hearts are. When we are away from home, we try to feel at home. In her Christian novel, Donna writes about returning home. God gives us a longing for our eternal home. For now, Donna Cronk calls Pendleton, Indiana, her home. She has written for Hoosier newspapers for more than three decades. For more stories and perspectives on life, see Donna’s FaceBook page, Sweetland of Liberty Bed & Breakfast by Donna Cronk. Her novel, Sweetland of Liberty Bed & Breakfast, is available on Amazon. Recently, I returned to the county we called home during most of the 1980s. On the way there, I wanted to look at the farmhouse that we rented for most of those years. 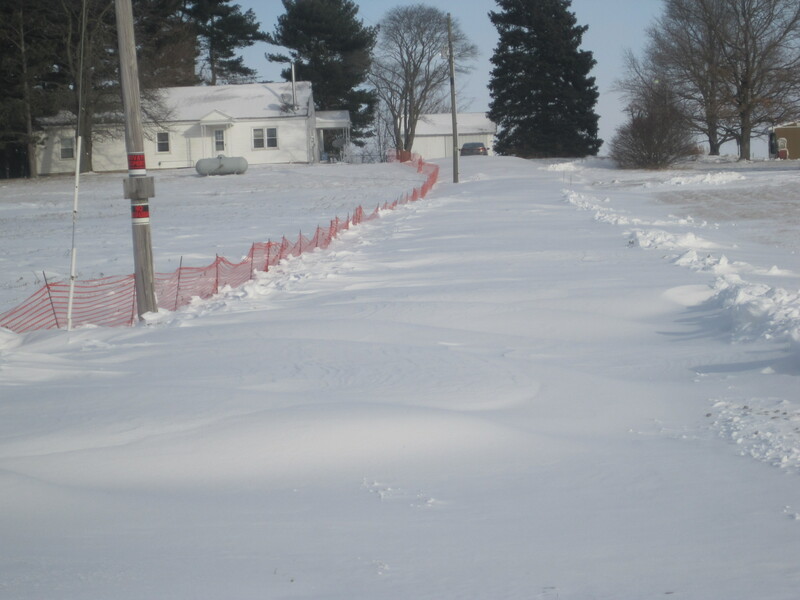 At the edge of the road, I took a picture of the snow-covered lane to show my husband. That lane was the bane of our winter months because it blew shut so frequently. I knew he would remember and chuckle, relieved to be free from that issue. Even so, that home back down the lane was dear to us. We rented it for $200 a month from a sweet old farmer who had moved “to town” with his wife, but continued to plant a garden out there and insisted that we eat our fill and then some of the fresh vegetables. It was up that lane that we brought our newborn son Sam home for the first time. As I paused there briefly at the end of that lane, it occurred to me that while this was once our home, it was no longer that at all. The “Private, keep out” sign on the telephone pole was directed at strangers … at me. The people who lived there now didn’t know me from the man in the moon. The thought was sad. As we near retirement, my husband and I discuss where we might want to call home for that phase of our lives. Brian’s comment that he wouldn’t mind spending it back in my hometown in a different part of the state helped inspire me to write a novel, Sweetland of Liberty Bed & Breakfast. In my fantasy-writing world, we would return there and open an inn. But the hometown I remember wouldn’t be the same hometown against the backdrop of our retirement years as it was against the framework of my youth. My parents have passed on and we no longer own the family farm. The children I played with as a kid are as grown and gone as I am. Our own kids never lived there so there would be no nostalgia on their part. In fact, we might be strangers in a familiar landscape. Guest Blogger Donna Cronk with our “connection”: God’s Word & her first Christian novel. There was no reason, frankly, to think that I’d ever hear from, or maybe even about, Debbie McCray again. About a decade ago, Debbie and her family moved from our subdivision in Indiana, to the southwest corner of Ohio, a few hours away. Debbie and I had been friendly, and sometimes sat next to each other in church. Our sons played together and two of them were even very good friends as well as childhood playmates. Other than place on the map and our boys, however, Debbie and I didn’t on the surface have a whole lot in common. We enjoyed passing the time as neighbors. But close? We weren’t. I guess that’s why it surprised me when Debbie included us on her Christmas card list. Still, it was nice to catch up with a few lines around the holidays. This went on for a decade and honestly, it was all her doing. Every year I half expected for the cards to stop. They never did. Then, about a year ago, an email arrived, out of the blue, from Debbie. She told me about some devotions she wrote that her church published. She told me about some other writing she was doing and about her dream to write a book. I was stopped in my tracks. At the very same time, I was working feverishly on my own book. In fact, my husband and I had established 2013 as The Year that I get my novel out there. What are the odds that Debbie would contact me, one, and two, what are the odds that she would mention a dream of her own book, randomly, at the very same time that I was pounding daily into the computer on chapters of mine? I wrote back to her about what I was up to and Debbie said we should be accountability partners. This threw me. I told her it sounded too “AA” for me. And maybe, I just didn’t want to be accountable. What if my book did not happen? What if hers sailed through on a breeze and here I am, a 30-year journalist, who couldn’t complete one small novel in the year designated for that purpose even though I’d been plucking away at it for four years? Best to keep such dreams to oneself, I thought. Debbie told me that she meant being accountable in a “fun” way. OK, we’d try it. Before I knew it, we were exchanging great information that we learned at writing conferences. We discussed the merits of professional editing, of selecting publishing houses, of how to handle sticky situations. We were becoming colleagues. For me, it really was the year to publish. 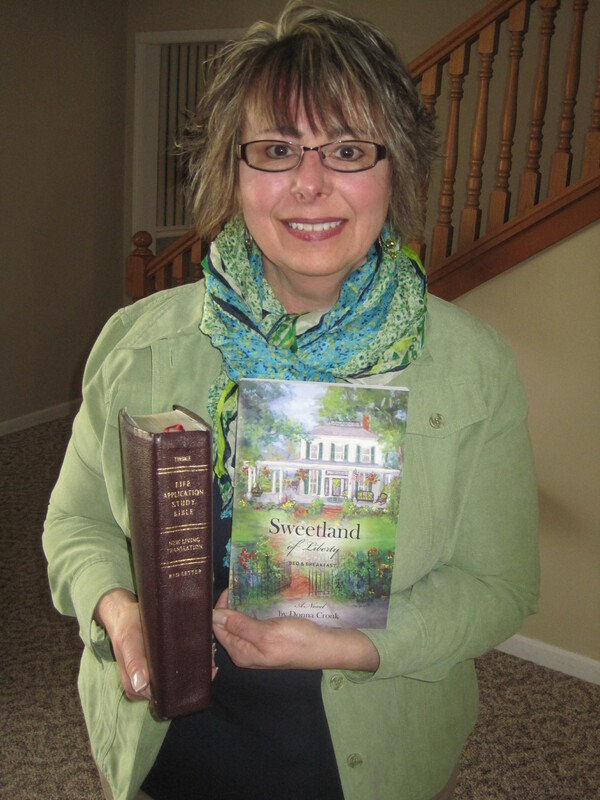 My Christian women’s fiction novel, Sweetland of Liberty Bed & Breakfast was published in January. Soon after, Debbie was blogging. And here we are. Email buddies. A writing support group of two. And even though I’m not fond of the term, yes, we became accountability partners. God chooses whom he chooses for his purposes. There is no other explanation than to recognize that God decided that Debbie and I needed to be friends and to encourage one another at this particular place and time in our lives. God knew before we did and watched as we discovered his special gift to us. We are sisters in Christ with the same heart to honor the Lord in our writing.